Directions (1-5): Study the following pie-chart and table carefully and answer the questions: The Table below shows the discount % given by different shops A1, A2, A3 and the following line graph shows the profit % gained on the given articles by the given stores. It is given that Market Price of any article at every shop is same. Quantity I: Find the marked price of an article in Shop A1, if the average cost price of an article 4 and 5 is Rs. 5550. Which of the following should be placed in the blank spaces of the expression “Quantity I __ Quantity II ___ Quantity III” from left to right with respect to the above statements? From Quantity I: Find the marked price of an article in Shop A1, if the average cost price of an article 4 and 5 is Rs. 5550. 2. Find the CP of Article 4 if the average SP of this article in all the shops is Rs. 7710? 3. What is the approximate difference between the CP of Article 3 of Shop A2 and Article 2 of Shop A3 if the MP is Rs. 2450? 4. If the CP of Article 2 of Shop A2 is greater than CP of Article 1 of Shop A3 by 350. What is the difference between the SP of Article 1 of Shop A2 and SP of Article 2 of A1? 5. If Article 6 is introduced in Shop A1 with SP of Rs 4560 and if it equals the CP of Article 2 of same shop. What will be the approximate discount % on it? Directions (6 – 10): What should come at the place of question mark in the following questions? = > 40 + (40/100) x 7800 + 540 = ? = > 40 + 3120 + 540 = ? = > 3700 = ? = > 333.33 – 213.83 =? 9. √5776/4 - √4225 + √9604 x 5 =? √5776/4 – √4225 + √9604 x 5 =? = > 76/4 – 65 + 98 x 5 =? = > 19 – 65 + 490 =? = > 19200 – 1152 + 300 =? 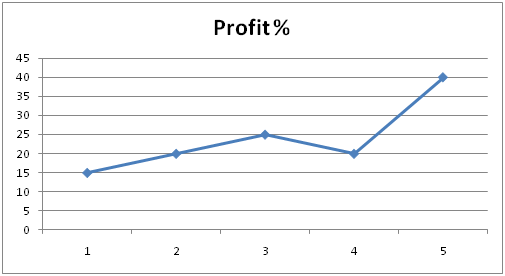 The Table below shows the discount % given by different shops A1, A2, A3 and the following line graph shows the profit % gained on the given articles by the given stores. It is given that Market Price of any article at every shop is same. 2) Find the CP of Article 4 if the average SP of this article in all the shops is Rs. 7710? 3) What is the approximate difference between the CP of Article 3 of Shop A2 and Article 2 of Shop A3 if the MP is Rs. 2450? 4) If the CP of Article 2 of Shop A2 is greater than CP of Article 1 of Shop A3 by 350. What is the difference between the SP of Article 1 of Shop A2 and SP of Article 2 of A1? 5) If Article 6 is introduced in Shop A1 with SP of Rs 4560 and if it equals the CP of Article 2 of same shop. What will be the approximate discount % on it? 9) √5776/4 – √4225 + √9604 x 5 =?